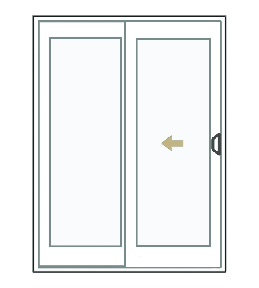 Similar to sliding patio doors, french-style sliding doors are ideal for locations with limited floor space or furniture near by with the appearance of traditional french doors. Create an entrance that is beautiful from both inside and outside your home. Milgard French-Style Sliding Doors combine space-saving convenience with the elegance of a French patio door. A French-Style sliding door has the appearance of traditional swing French doors, with wider stiles and rails, while functioning as a sliding glass door. For a multiple-pane look, choose from a variety of grid options available to create the look of individual lites. Explore Milgard French-Style sliding doors by product line or frame material below. Learn more about the new Essence Series Sliding Patio Door with a solid wood interior. A beautiful, premium vinyl door crafted from Milgard's proprietary formula. Beautiful to look at with little upkeep required, Ultra™ Series fiberglass doors are built to last. French Doors in Your Home The primary reason behind renovating is incorporating features that enhance the amount of light, space and beauty, which leads many homeowners to consider adding in French doors. Get inspired with these design ideas for incorporating French doors in your home.